A high school grad in 1934 who then went to work for his dad, and went through 7 cars in those years, rebuilding and redesigning them, and taught himself car design, which motivated him to send Harley Earl some sketches that instantly got him hired. The idea for VentiPorts grew out of a modification Buick styling chief Ned Nickles had added to his own 1948 Roadmaster. Four amber lights were installed on each side of the car’s hood which were wired to the distributor. The lights flashed on and off as each piston fired which was supposed to simulate the flames from the exhaust stack of a fighter airplane. Combined with the bombsight mascot, VentiPorts put the driver at the controls of an imaginary fighter airplane. In 1958, Ford had redesigned its Thunderbird, enlarging it and putting in a back seat. 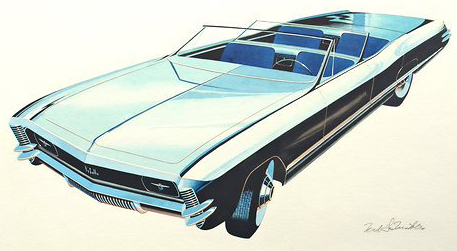 GM was desperate for a competitor, and in mid-1959, Mitchell tapped designer Ned Nickles to design a Thunderbird competitor for Cadillac. Ned Nickles also created the Buick "hardtop convertible," which wasn't a convertible at all but a hardtop without a pillar between the door windows and the rear side windows. Another of his contributions was the "sweepspear," a bright metal sculpture that swooped down the side of the car and kicked up over the rear wheel opening.